A sports journalist debuts with a very personal account of the return of LeBron James to Cleveland in 2014 and of the Cavaliers’ NBA championship in 2016. 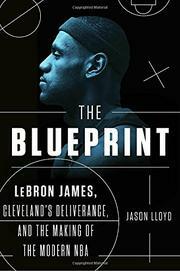 Lloyd—the lead NBA writer for the Athletic and former writer for James’ hometown Akron Beacon Journal during the team’s efforts to lure the King back to Cleveland after his dramatic 2010 departure to the Miami Heat—tells several interlocking stories: James’ decision to leave the team, the four intervening years when the Cavs’ front office began plotting to get him back, the arrival of key players (especially Kyrie Irving, Kevin Love, and J.R. Smith), accounts of failed coaches (David Blatt’s tale is especially painful), the changes in the NBA itself, and, of course, that championship that erased decades of frustration for Cleveland sports fans. (Lloyd reminds us several times of the key misplays and failures of the Indians and Browns.) The author deals thoroughly with the front-office attitudes and decisions about losing frequently so that the franchise would earn a good draft position. He also tells us a bit about himself, discussing a sports journalist’s difficulties in balancing family and professional responsibilities, and he describes some of his coups and failures; he even tells us near the end that James gave him a nonverbal shoutout at the city’s massive street party for the Cavs after their championship. At times, Lloyd does veer near homer-hood when he celebrates coach Tyronn Lue, who “was masterful with his lineups throughout the postseason,” and during his long account of Game 7 of the 2016 Finals. Most interesting to general readers will be the pages dealing with the intricacies of NBA management, the relationships among the players (Love’s complicated story is key), and the staggering egos of professional athletes. Exciting game action blended with mostly interesting behind-the-scenes maneuvers and manipulations of a pro-sports franchise.